Khayelitsha is the largest township in Cape Town and is situated 30km south east of the city centre, just off the N2. It’s a vibrant township known for its entrepreneurial spirit and social development projects. The people are friendly and inviting, the area is rich in culture and diversity, and is a truly South African experience that will stay with you forever. Khayelitsha’s eateries offer a mix of traditional and western food, but it’s the more traditional local dishes that offer unique culinary experiences. Every restaurant has its own vibe, ensuring you experience an authentic feel of the township with every meal. King Steak’s food is predominantly inspired by the local heritage. Serving a variety of ‘kasi-urban’ (urban township) foods from African meals, braai (barbecue) meat, buffets, and breakfast. Kefu’s is a vibrant pub, restaurant and B&B that offers delicious, locally inspired steakhouse-style meals, as well as the best in Jazz, Soul and African music. Recently renovated, the pub and restaurant has great views of the local community. The first artisan coffee shop in Khayelitsha, The Department of Coffee has become an institution with visitors. Friends Wongama, Vusumzi and Vuyile opened the coffee shop in 2012, with the aim of bringing coffee culture to the township. Using their own house blend, the expert baristas will serve up all types of coffee, from cappuccinos to latte’s, and Americanos to iced coffees. For the healthiest bread in town, head over to Spinach King, situated just around the corner from Khayelitsha station, as well as in Khayelitsha Mall. From his converted container, Lufefe Nomjana sells delicious spinach bread, muffins and sandwiches made from locally grown spinach. 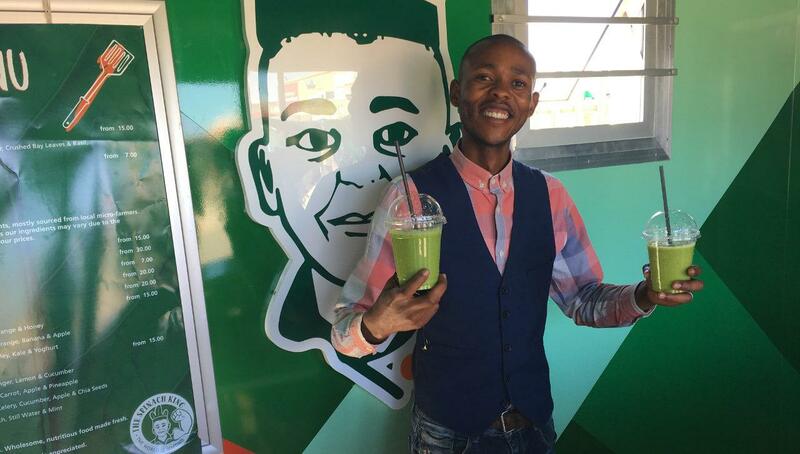 Lufefe Nomujana – aka The Spinach King. 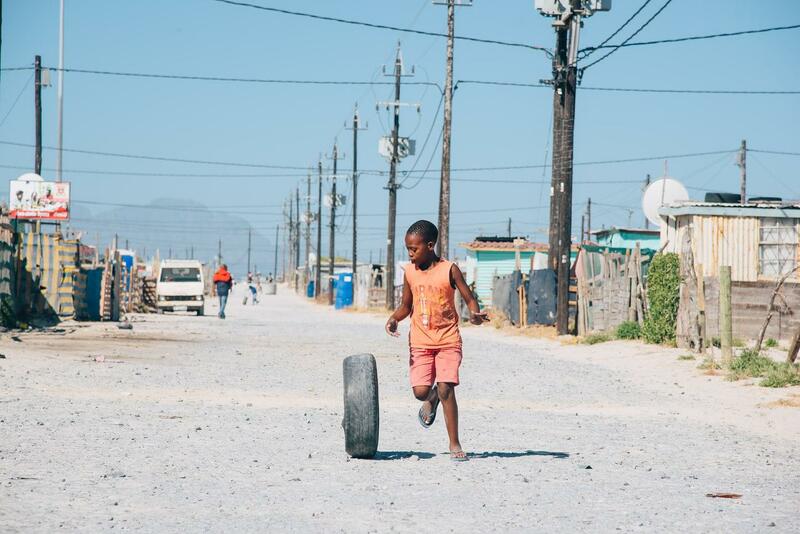 Sport plays a big role in youth development in impoverished communities like Khayelitsha with everything from soccer to cycling to surfing and even canoeing used to engage with young people in the township. The Khayelitsha Canoe Club is the first of its kind in a South African township, where watersports are rare. Established in 2013 with only two boats, the club teaches the youth of the community about paddling as a sport. The club has grown tremendously since its inception and the latest offering is canoe polo, a favourite among the kids. They also offer boat rides for tourists who are welcome to come along for a paddle. Waves for Change provides youth development programmes in troubled ocean-side communities, using surfing as the focal point. Tim Conibear started in 2011 in Masiphumelele Township south of Cape Town’s CBD and branched out to Khayelitsha in 2012. Every week the initiative reaches around 160 young people from Khayelitsha alone, and is going from strength to strength. The Velokhaya Life Cycling Academy uses cycling as a means to provide children of impoverished communities with essential life skills and opportunities that will help them have a positive impact on their community. They also strive to turn local youth into role models for the community by encouraging cycling excellence and developing champion cyclists, a number of whom have achieved great heights in the sport, both locally and internationally. The facility in Khayelitsha includes a BMX track, as well as a gym equipped with advanced cycling equipment, and a learning centre. Another organisation that is helping the youth through sport is Grassroot Soccer. Through soccer, immensely popular in the township, they educate young people on various health issues that affect them and their communities, especially HIV and AIDS. Adolescents are a high risk group concerning health and Grassroot Soccer’s curriculum is designed to engage with this group through various soccer based activities. Township culture is vibrant, colourful and unique to South Africa and has been shaped by the melting pot of cultures forced to live together when the townships were created. But all are unique in their own way. The best way to experience township culture, is by hanging out with the locals. One of the best ways to see and experience Khayelitsha is by taking a walk through the township and interacting with its people. 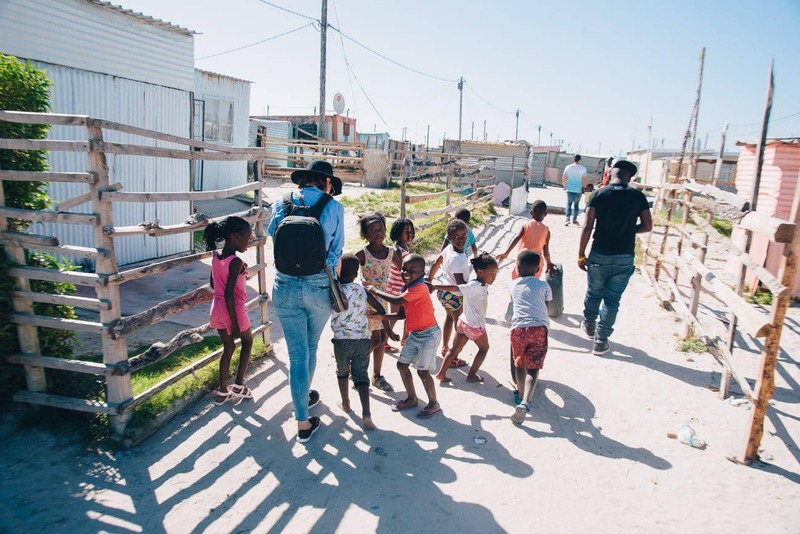 Juma Mkwela’s walking tours are well known for not only showing people around the townships, but also getting visitors involved in helping to create sustainable, positive change in the community. This is achieved through the planting of vegetable gardens, creating street art and more. Through this, Juma, a well-respected member of the community, enables visitors to connect with locals on a meaningful level. Juma’s tours are custom made to suit your interests, whether it’s sports, health care, food, or just getting an overview of everyday township life. The 18 Gangster Museum concept was first launched as a pop-up museum that formed part of the ‘Together Against Crime Festival’ that took place at Cape Town Artscape Theatre from 28 September to 1 October 2016. Housed in a shipping container, the museum had two sections – a replica of a prison cell in Cape Town’s notorious Pollsmoor prison, the other an exhibition and information on how the youth can avoid a path that would lead them to end up in a cell. During the exhibition the cell was occupied by real former gang members with whom visitors could interact and talk to. The museum’s Wandisile Nqeketho and his partners are currently in the process of creating a permanent museum that will be located on Khayelitsha’s famous Lookout Hill. A favourite stop among tourists is the Khayelitsha Craft Market, situated at the St Michael’s church in the heart of the township. Here visitors will find a selection of pottery, beadwork, baskets, paintings, curios, and many other hand crafted items made of everything from plastic shopping bags, soft drink cans, wire, stone, scrap metal, and traditional beadwork. The market displays the voice which this impoverished community has found through art. Visitors can also grab a bite to eat, with vendors selling traditional food at the market. The late Vickey Ntozini was one of the pioneers of township tourism and started her B&B back in 1999, the first in the township. Her legacy lives on and the B&B offers four rooms, with breakfast and dinner being served. Visitors can pop over to the shebeen across the road for a drink with the locals. Another famous B&B in Khayelitsha is Lungi’s has been welcoming visitors since 2009. It offers three guest rooms and every morning Gladys prepares a delicious breakfast consisting of traditional African dishes. Find out more about Lungi’s B&B – tt’s the perfect way to experience the township vibe. Bordering a large informal settlement within Khayelitsha, Sisero 1 have a total of eight guest rooms. If you’re hungry, Nomhle offers breakfast, lunch and dinner at an additional fee. Popular accommodation listing site, Airbnb recently branched out to Khayelitsha and there are already quite a number of accommodation options available on the site. Before booking, check with the host whether they provide transport, as self-drive is generally not recommended for tourists in the township. Nobody knows Cape Town better than a local. When you’re in town be sure to visit the local VIC in Burg Street where staff can help you really uncover the magic on offer in the CBD and beyond. Call 0861 322 223 for more details.